Yealink SIP-T46G IP Phone | 8x8, Inc. 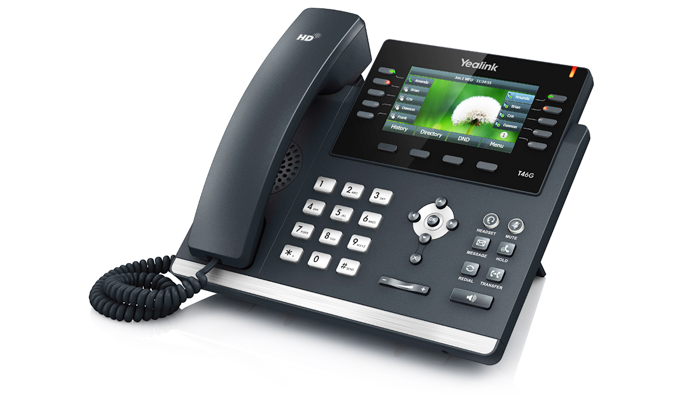 The Yealink SIP-46G is a durable mid-range business phone that delivers unsurpassed voice quality and clarity. It provides a high-quality, cost-effective solution for front line staff handling moderate call volumes and improves productivity for office workers. The high-resolution TFT color display is intuitive, makes navigation easy and requires minimal training. Yealink Optima HD technology enables rich and clear life-like voice communications. Comes with a built-in Gigabit Ethernet bridge to connect a high speed device to your phone. 10 Line Key Buttons — Use the standard two line keys for managing two live calls on your phone at the same time, and use the others as speed dial keys.